Product prices and availability are accurate as of 2019-04-24 04:27:21 UTC and are subject to change. Any price and availability information displayed on http://www.amazon.com/ at the time of purchase will apply to the purchase of this product. The Bercom HANDy Paint Pail was designed to make your painting projects a breeze! Ruggedly constructed for both professional and do-it-yourself painters. The HANDy Paint Pail will withstand years of use, is solvent resistant and works with any paint or stain. The HANDy Paint Pail is easy to clean and makes wash-ups fast and effortless. 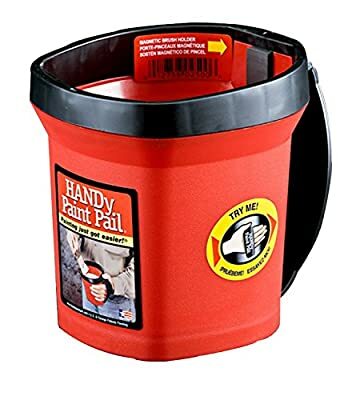 The HANDy Paint Pail's adjustable strap reduces fatigue in your arm, hand and fingers by supporting your hand comfortably and firmly against the pail's side. The strap can also be adjusted to let you attach the pail to your belt for convenient hands-free use. A built-in magnetic brush holder on the inside rim keeps your brush wet and in place while you move, reducing the risk of dripping paint when the brush is not in use. The built-in brush scraper helps you easily remove excess paint from the brush before each application, as well as protecting against messy drips down the side of the pail. With a sturdy plastic construction, this paint pail is solvent-resistant, easy to fill, easy to clean, and built to withstand years of use.